Wallace Richards Woodbury, JD 49, is a man of legendary accomplishments. Wally Woodbury, an attorney, real estate developer, and policymaker from Salt Lake City, has long been recognized as one of the states leading citizens. 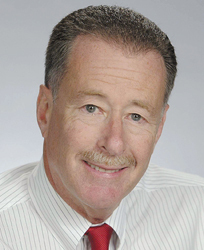 He is senior partner with the law firm of Woodbury & Kessler and chairman of the Woodbury Corporation, among the Wests oldest and most respected commercial real estate developers. Woodbury also is regarded as one of the countrys premier and most distinguished experts on taxation. In keeping with his unsurpassed reputation, Woodbury and his family recently created an enormously generous endowment fund to establish a University Professorship at The George Washington University Law School. Stephen A. Saltzburg, an internationally renowned scholar on the GW Law faculty, was recognized as the inaugural Wallace and Beverley Woodbury University Professor at a ceremony in Salt Lake City in January. The event featured, among others, Utah Sens. 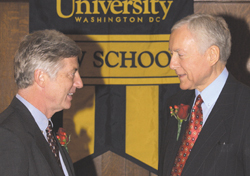 Orrin G. Hatch and Robert F. Bennett, as well as Ross Rocky Anderson, JD 78, mayor of Salt Lake City. All three leaders are personal friends of Woodbury. Professor Stephen A. Saltzburg is an appropriate inaugural recipient of the Woodbury Professorship, given his extraordinary record of personal achievement and service to the Law School and the study of law. Saltzburg served as associate independent counsel during the Iran-Contra investigation in 1987, and later as deputy assistant attorney general in the criminal division of the Department of Justice. More recently, Saltzburg has held chaired professorships at GW Law and at the University of Virginia. After law school he clerked for Supreme Court Justice Thurgood Marshall. Born and raised in Salt Lake City during the Depression, Wally Woodbury received his undergraduate degree at the University of Utah, where he met his wife of 56 years, the late Beverley Clair Beesley Woodbury. He married her two years later, just prior to enrolling at GW Law, from which he gradu-ated Order of the Coif in 1949. Woodbury returned to Utah after graduating from GW, where he established a successful practice of real estate and tax law. Woodburys middle child, Jeff, says that his fathers tremendous success as a young, self-employed lawyer was in keeping with his leadership abilities, strong personality, and natural talent for business. In 1957 Woodburys father, F. Orin Woodbury, who founded the Woodbury Corporation in 1919, ceded management of the corporation to Wally because of poor health. Woodbury learned the real estate business and oversaw the Woodbury Corporation while still managing to stay involved with his law firm, a relationship which he maintains to this day. Fortunately for Woodbury, his eldest son W. Richards Rick Woodbury took the helm of the Woodbury Corporation in the mid-1970s. Rick Woodbury, coincidentally, was a classmate of Dean Young at Harvard Law School around that time. Both men speak Japanese, and Youngs son was born at the same time as Rick Woodburys oldest daughter. Woodbury testified regularly before Congressional Ways and Means Committees on real estate taxes, and Sen. Hatch says he and his colleagues always consulted Woodbury as an expert on the subject. Professor Stephen A. Saltzburg is the inaugural Wallace and Beverley Woodbury Professor. As philanthropists, Wally and Beverley Woodbury have long been generous supporters of educational institutions. 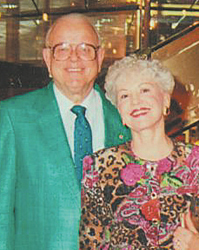 Their philanthropy has included naming the business school at Utah Valley State College in honor of Wallys parents, F. Orin and Nina R. Woodbury, as well as the UVSC-Woodbury Art Gallery. Their generosity provides numerous academic scholarships at UVSC and several athletic scholarships at the University of Utah. The Utahn law students often would work in Smoots Senate offices during the day and study at night in the Law Schools evening program. Among the prominent individuals who came to GW Law School as Reed Smoot protégés are Ernest L. Wilkinson, JD 26, who later served for many years as president of Brigham Young University, and his brother Glen A. Wilkinson, JD 38, who served as president of The George Washington University Board of Trustees. Smoots encouragement of Utahn law students contributed significantly to the development of the legal community in Utah and to the Law Schools growth as an internationally renowned institution. Wally Woodbury understandably has always been very proud of his Law School degree and of the School. The Law School inaugurated The Wallace and Beverley Woodbury Professor at a Jan. 8 ceremony in Salt Lake City. Several prominent Utahns attended the ceremony, including Salt Lake City Mayor Ross Rocky Anderson, JD 78, and Sen. Orrin Hatch (R.-Utah), both of whom are friends of Wallace Woodbury. Steven Tasher, JD 73, and his daughter, Lindsay, who just finished her second year at GW Law, in the Law Schools Steven A. and Barbara Tasher Great Room. The Jacob Burns Law Librarys Steven A. and Barbara Tasher Great Room is a place of quiet study. The expansive wooden desks, straight-backed chairs, and soaring ceiling underscore the reading rooms serious and reflective mood. This notable quietude greatly appealed to Steven Tasher, JD 73, and his wife, Barbara, whose very generous donation allowed the Law School to dedicate the room in their name and honor. Tasher views the Great Room as a link to the past, to a simpler time before cell phones, fax machines, and computersspecifically, to the time when he was a student at the Law School in the early 1970s. Clearly the Law School has improved in strides, both academically and in its physical facilities, since Tasher graduated 30 years ago. Quiet study spaces, among other things, were in short supply. He describes the Law School then as a one-room schoolhouse. Incredibly, the Law School managed to support a community of students, faculty, and staff not much smaller than its current one, though without the benefit of Stuart or Lisner Halls. Tasher had not returned to the Law School until several years ago, when he was visiting with his daughter, Lindsay, who had been accepted to GW Law and is now a thriving 2L. Lindsay Tasher recently was selected as a Deans Fellow and is involved with the Student Mentor Program, the Alternative Dispute Resolution Board, and the Student Bar Association alumni relations committee. She recently put her undergraduate acting experience to good use in scripting and performing in this years successful Law Revue show. The early 1970s was an exciting time to study at the Law School, given the political upheavals of the early part of that decade. He recalls, I remember not being able to get from the Law School to the Marvin Center, because of the protests and related activities. After studying all day as a 1L, he stayed up late at night talking with his next-door neighbor, Edward Blackmon, JD 73, about their shared desire to make a difference back home through the law. 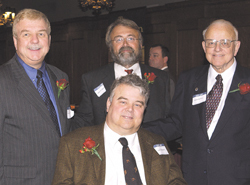 For his part, Blackmon returned to Mississippi, joined the state legislature, and became a champion of civil rights in the region (see the spring 2003 issue of this magazine). Tasher and Blackmon have been reunited by their shared service on the Law Schools Board of Advisors. Tasher went on to an equally impressive career in his home state of New Jersey. In his words, But for the excellent education I received over my three years there, and the benefits that education provided me, I could not have achieved everything I have in life. He certainly has achieved much in years hence. Indeed, his biography is a textbook case of by-the-bootstrap self-improvement in the finest tradition of American democracy. His grandfather landed at Ellis Island at age 12 with, yes, only a few dollars in his pocket. It was just before World War I, and he and his brother had wisely chosen a new life in America instead of in the Russian Army. The brothers survived the Depression of the 1920s on Manhattans Lower East Side. Tashers parents raised him in suburban New Jersey, mere miles from his current residence and place of employment at the pharmaceutical giant Wyeth. Tashers father was a hardworking salesman and his mother was a housewife. His parents instilled in him the value of a good education and hard work. He worked from the age of 9, mowing lawns and the like, which he credits now for helping him to understand workers points of views in his current role overseeing thousands of employees. In high school Tasher was a state debate champion and an actor. Both skills helped place him on the legal path (versus medicine, the only alternative deemed acceptable by his parents). As a senior, he was chosen to speak at his high school graduation, an honor that he recently repeated as a distinguished alumnus. After high school, Tasher enrolled at Rutgers University, becoming the first in his family to attend college. It was a brave new world for me, he says, and he endeavored to learn as much as he could. He chose GW for law school to have the opportunity to study outside his home state and to enjoy the advantages of an education in the nations beautiful capital. Tasher graduated from Law School with honors, and was then faced with three options for work: government, a New Jersey firm, or a New York firm. Back then the differences in salary between the private and public sectors were inconsequential, and he chose government work in the New Jersey Attorney Generals Office. He was thrown to the lions, in his words, by practicing in court literally every working day for his first two years. That extended trial experience made him a seasoned litigator, and he rose very quickly in the ranks, eventually becoming deputy attorney general and chief counsel to four cabinet officers. Many of Tashers subordinates in the government later went on to careers on the bench, though he transferred after seven years to work in corporations and private practice. He first joined the DuPont Co. to learn at the foot of masters, in his words, in its outstanding legal department. Then he worked for the now-defunct firm of Donovan, Leisure, Newton & Irvine, a firm founded by the prominent figure William J. Donovan, regarded as the father of American intelligence for his role as the founder of the Office of Strategic Services, the predecessor to the CIA. Tasher later was hired away by the law firm of Willkie, Farr & Gallagher, where he expanded his own thriving environmental practice with 16 junior attorneys before being recruited in 1992 by the chairman of a client company, American Home Products. Jack Stafford, JD 62, the chairman, had appreciated and admired Tashers great work for American Home Products (now known as Wyeth) over the years. For the past 12 years, Tasher has served as vice president, environmental affairs, and associate general counsel of Wyeth. His responsibilities have increased steadily during his tenure; currently, among other responsibilities, he oversees Wyeths environmental and energy departments, real estate department, facilities operations, and legal department. He now is in a position to look back at GW Law with fondness and pride, appreciating how much the Law School helped him. Thanks to his extraordinarily successful legal career, Tasher is now in a position to give back generously to his alma mater, and he encourages others to do the same. As for the Great Room, GW Law trusts students will indeed live up to his wishes and leave their gadgetry and paraphernalia of the 21st century at the door while pursuing a good ol fashioned legal education at the Law School. Most alumni donors to the Law School report that they give, in part, because they feel their education at GW has served them well in their careers and in their lives. For Ernest Auerbach, JD 61, BA 58, that payoff was hard-won but well worth it. He describes law school as excruciatingly hard work, but his impressively diverse and successful career is testament to the value and opportunities presented by an education at the Law School. Auerbach currently works for the American Life Insurance Co., a division of AIG. He is responsible for executive development in his role as vice president. He was raised in New York and moved to Washington to attend GW, where he was editor of The GW Hatchet student newspaper and graduated with a degree in foreign affairs. He enrolled directly thereafter in the Law School, where he reports spending most of his time in the library. I wasnt a natural student, he explains, but it simply may have been the case that the Law School was that tough. He estimates an attrition rate of roughly 50 percent among his fellow classmates in the first year, and reports that in the first year, the topics were easy, but they tried to flunk you. (At the time, law schools then lacked a standardized test like the modern LSAT to filter candidates for admission.) He also says only 55 percent of candidates passed the D.C. bar his year. After graduating from the Law School, Auerbach joined the U.S. Armys Judge Advocates Generals Corps, which sent him to serve in both Germany and Vietnam. He left active duty after seven years but continued to serve in the U.S. Army Reserves, through which he attained the rank of colonel and was decorated with the Legion of Merit with Oak Leaf Cluster and the Bronze Star. He practiced law for the first 19 years of his career but has subsequently spent 25 years in business, for which he says my legal training continues to be relevant to my work. He made the transition from law to business at the insurance company INA (now CIGNA), where he moved from the post of associate general counsel and staff vice president to the role of president of International Life and Group Operations. More recently, he was president and chief operating officer of New York Life Worldwide, director general of Azteca Insurance (of Mexico), president of UICIs insurance group, and president and CEO of Tesia Corporation (an early stage technology company). Earlier, he started and led Andersen Consultings Mexican insurance practice. Auerbach also is a published author. He wrote a guidebook for senior executives, Joining the Inner Circle, How to Make It as a Senior Executive (John Wiley & Sons, 1990), and has contributed articles on business and defense topics to The Wall Street Journal and other publications. 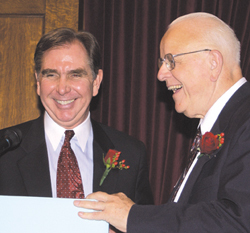 He currently is on the State Board of Directors of Audubon Connecticut and has served on the board of directors of the Salvation Army in Mexico City. Regarding his motivations for giving, Auerbach explains that my wife and I decided to give a gift to the Law School because George Washington helped me enormously in my career. He is particularly pleased to support GW because, in his judgment, Both the University and the Law School have improved many fold in the scope and quality of the instructors, and he has followed recent developments at the Law School with great interest. Auerbach encourages other alumni to donate generously to the Law School.